South Korean military authorities are scrambling for a response to North Korea's new short-range ballistic missile that was unveiled at a military parade in Pyongyang on Feb. 8. The missile looks strikingly similar to Russia's Iskander SS-26 missile which also formed the inspiration for South Korea's Hyunmu-2 and could be very hard to intercept. There is speculation that the new North Korean missile could dodge air defenses and hitting the military base for a Terminal High-Altitude Area Defense battery in Seongju, North Gyeongsang Province, if it has the same capability as the SS-26. 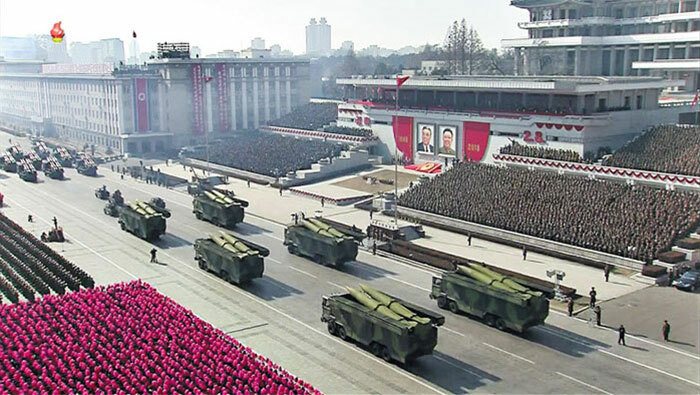 Vehicles loaded with short-range ballistic missiles parade through Pyongyang on Feb. 8, in this grab from [North] Korean Central Television (file photo). At first observers speculated that the new missile might be an improved version of the KN-02 or Toksa short-range ballistic missile with a solid-fuel engine. But it has a larger diameter and is longer, and the wings also look more similar to the SS-26's. Another similarity is that two of the missiles were carried on an eight-wheeled mobile launcher. Various SS-26 versions have maximum ranges between 280 and 500 km. The new North Korean missile in question is speculated to have a range of longer than 280 km. This means that it is capable of reaching the THAAD missile base. The SS-26 has a uniquely low trajectory that allows it to avoid intercept, just like a glider. With a maximum range of 280 km, the SS-26 can reach a height of only 50 km, compared to other ballistic missiles' altitude of 80 to 90 km. That would make it difficult for the Patriot PAC-3 missile or the home-grown surface-to-air Cheongung missile to intercept the new North Korean missile. In August last year, the North fired an unidentified short-range missile from Kitdaeryong, Kangwon Province, which may have been the one in question. "It flew 250 km but reached a maximum altitude of a mere 50 km, which made us believe that it was fired from a multiple rocket launcher," a military source said. "That is the same height as the SS-26, and the trajectory was also different from that of other ballistic missiles."